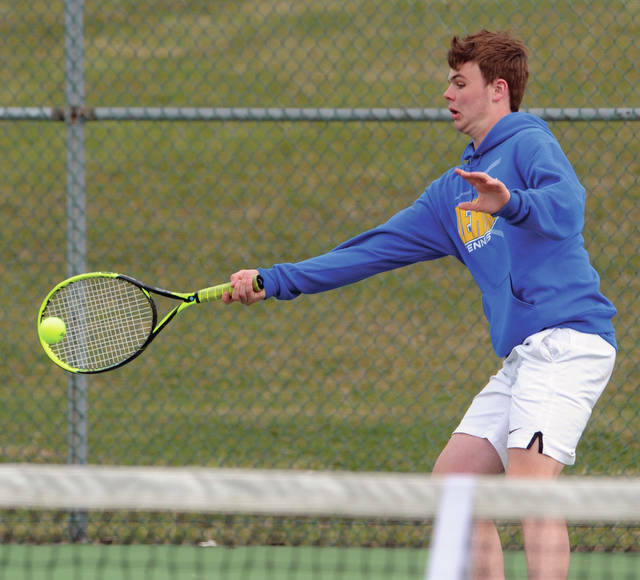 Lehman Catholic’s Danny Lins hits a forehand against Piqua Thursday. Piqua’s Demi Nicholas hits a backhand return against Lehman Catholic Thursday. Lehman Catholic ’s Sam Gilardi stretches to chase down a drop shot against Piqua Thursday. Piqua’s Jackson Elliott makes an overhead return against Lehman Catholic Thursday. 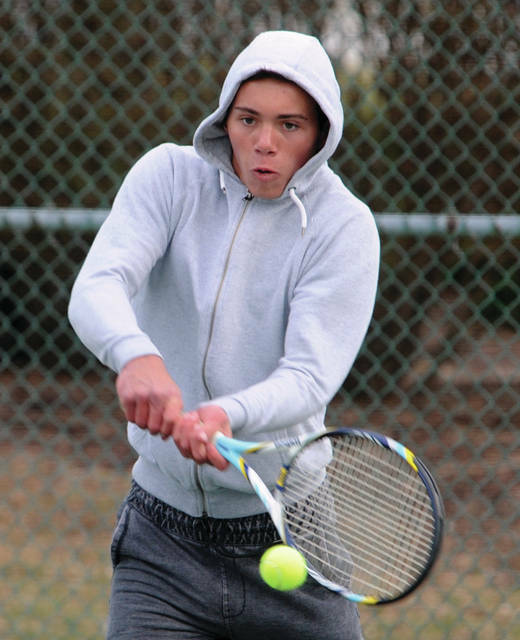 SIDNEY —- It is two high school tennis programs at completely different points. 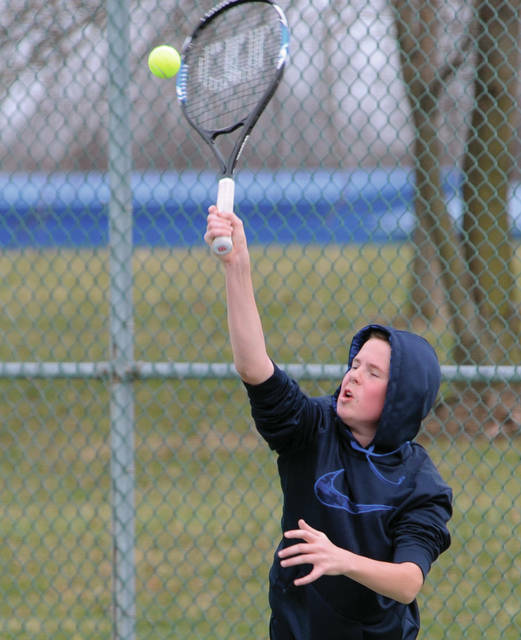 So, the results in Lehman Catholic’s 5-0 win over Piqua tennis were not completely unexpected. Lehman Catholic coach Tim Ungericht has continued the success previous coaches had at Lehman, while Piqua first-year coach Brian Gillespie is looking to put the beginning pieces in building a program. Lehman was coming off two tough matches with Milton-Union and Troy and the victory improved the Cavaliers to 4-3 on the season. 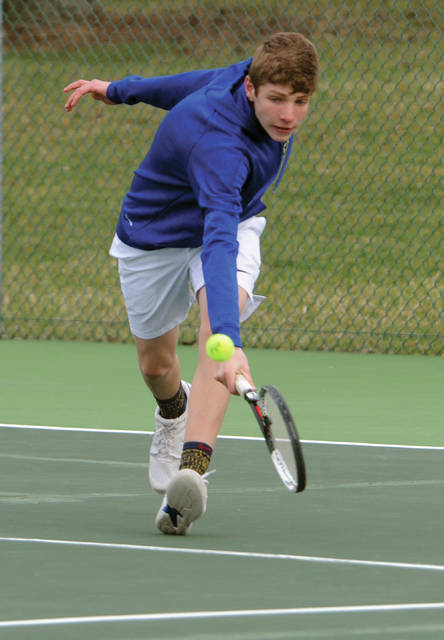 In singles, Danny Lins defeated Demi Nicholas 6-1, 6-1; Sam Gilardi defeated Jackson Elliott 6-0, 6-0; and Max Schmiesing defeated Stephen Dolder 6-1, 6-0. In doubles, Elijah Jock and Eliaz Bezy defeated Cael Barr and Ethan Hammon 6-0, 6-1. And Ungericht is happy with his team’s progress this spring. “You look at everything we lost off last year’s team,” he said. “Danny is making a big jump from first doubles to first singles. He gets a couple wins and that will give him confidence. You look at the teams we lost to. Our other loss is to Wapakoneta who could be the WBL champions. Josh George defeated Noah Ruley 6-0, 6-0. Gillespie knew it was not going be a quick fix at Piqua. Piqua had opened the season with a loss to Xenia. Gillespie sees a bright future with the program. And Gillespie knows the biggest progress can come in the summer. And Ungericht has compassion for the Piqua team and encouraged them after the match. Piqua was scheduled to host Urbana Friday, while Lehman Catholic has a MVTCA Cup Flight Tournament Saturday.